This little known incident in Anglo-Chinese relations took place after the two Opium Wars (1839-42) and (1856-60) at the same time that the Taiping Rebellion was raging in southern China (1850-64) and illustrates the bizarre ways in which Britain and China struggled to co-operate. After the humiliating defeat in the second Opium War by Britain and the destruction of the Emperor’s beloved Summer Palace in 1860; it seems incredible that China would be working with Britain in the unlikeliest of ventures - procuring a modern joint navy from Britain to put down the Taiping Rebellion. Unsurprisingly the venture collapsed and left a legacy of further bitterness on both sides. To understand this strange affair it is necessary to take a look at the life of the prime mover. Horatio Nelson Lay (born 1832) is little mentioned in the history books and yet it was Lay who set up the Imperial Customs Union in China and it was he who is mostly responsible for the flotilla debacle. He represents the British attitude in the second phase of Anglo- Chinese relations that had moved from mutual incomprehension in the early 19th century to open hostility and distrust. He was a son of George Tradescant Lay, a missionary to China, who died in 1845. His impoverished mother then desperately sought a position for her young son in the Chinese diplomatic service. He arrived at Hong Kong in 1847 and learned Chinese from the noted missionary Dr. Gützlaff. He was one of the very first Britons to speak and read Chinese fluently; indeed his fluency in Mandarin and Cantonese was such that many could not believe he was not Chinese. He then started work at the British embassy as an interpreter. In 1854, aged just 22, he was appointed acting vice-consul for Shanghai and was dubbed the ‘Boy Consul’. In 1842 a Customs Union had been imposed as a condition of the treaties at the end of the first Opium War. By impressing Chinese officials with his language skills Lay was chosen by the Chinese to head the new Customs Union ‘to prevent corruption’ rather than the candidate put forward by the British. It was felt that a foreigner was better placed to arbitrate on indemnity disputes. Initial reports from his Chinese masters were favorable ‘H.N. Lay is the most crafty of barbarians,… we must continue to hold him responsible for all barbarians.’ He began the work at the burgeoning British run port of Shanghai. He succeeding in bringing far more money into the depleted imperial coffers than the Chinese themselves had been able to acquire - the revenue doubled in thirty years: 1845 5,526,435 Hong Kong taels of silver; 1865 8,297,000 and 1875 11,970,000. However, power went to his head, he was isolated without a wife or family and the precocious ‘Boy consul’ changed to ‘Junior autocrat’. In his defense it can be said that a strong, resolute hand was needed because China (with British direction) was setting up new institutions. By 1858 Shanghai was flourishing but the situation at Guangzhou (Canton) had deteriorated and the second Opium War was underway (1856-1860), not forgetting the much more significant ongoing Taiping Rebellion in southern China. In June 1858 Lord Elgin invited Lay to take part in the negotiations with the Qing as an interpreter; he accepted and became Elgin’s ‘attack dog’. The Chinese account is that ‘the barbarian H.N. Lay tried to force acquiescence and was discourteous in the extreme’. The Chinese had been used to negotiating from a position of strength because the foreigners did not understand the language or the accepted way of proceeding. Lay’s fluency and knowledge allowed him to circumvent the Chinese previously successful negotiating strategies. Lay’s masterstroke was to produce an official Chinese document that showed how they had planned to mislead the barbarians by guile. It was really down to him that the Treaty of Tianjin (1858) was reluctantly signed with much bitterness by the Chinese government and the Emperor. Lay benefited directly from the treaty, as he was appointed Inspector General for all the new treaty ports. He worked industriously to roll out the Shanghai model for international trading and was instrumental in translating a key book on International Law into Chinese so that at least the expected rules of commerce were known to both sides. He considered that he was providing a service to both China and Britain: ‘I need scarcely observe in passing that the notion of a gentleman acting under an Asiatic barbarian is preposterous. I am not a Chinese official but a foreign adviser without rank, but with a high and influential position, because trusted in and honored.’ He went on to explicitly state his shocking viewpoint: ‘there is no such thing, at present, as equality between the European and Asiatic… The Chinese are, when compared with ourselves, but children; fractious, vicious children they often are, but it is as children and not as grown-up men that they should be treated.’ His Chinese Customs Union was staffed chiefly by foreigners and not Chinese; at one time 62% of high officials were British. The Chinese approach can be summed up in the proverb 解铃还须系铃人 jiě líng hái xū xì líng rén ‘Whoever tied the knot on the tiger’s bell is the one to untie it’ meaning foreigners should be used to solve the ongoing disputes caused by foreigners. For centuries this had remained the Chinese way to manage foreign affairs. Lay worked hard and gained a reputation for fairness and impartiality but at the same time arrogance and peevishness. But in 1861 his career was in jeopardy. Britain had trained up a new generation of gifted Chinese interpreters; the ‘difficult’ Lay was no longer indispensable. The Taiping Rebellion was raging and the rebels looked as if they may topple Lay’s Qing employers and threaten the Customs Union that he had worked so hard to build from scratch. Lay became ill, probably from over-work, and declared that he must return to Britain on sick leave. He chose Robert Hart to deputize for him until his return. Both the Chinese and British found Robert Hart a much easier person to deal with. Hart went on to become the most powerful Westerner in China, and so dependable that the Chinese termed him ‘Our Hart’, however such affection did not prevent his palatial house being burned down in the Boxer Rebellion. In 1862 the Taipings had taken Ningbo and Hankou (Wuhan) and the Manchu government knew that a modern navy was vital to defend the low-lying waterways of Jiangsu and Zhejiang. The Taiping rebellion had now grown from an irritating group of bandits into a force threatening dynastic overthrow. The Qing government was desperate for help while the British, even though they did not comprehend the real strength of the rebellion, had become concerned that Shanghai might fall to the rebels. Because Britain remained formally neutral military aid could not give to either side so any help would need to be under U.K. auspices. Hart under the direction of Prince Gong (1833-98) as Prince Regent wrote to Lay commissioning him to buy ships for the Chinese government. Lay, still on sick leave in the U.K., engaged Captain Sherard Osborn to command the ships, recruit British seamen and sail them to China. A crucial meeting at the Royal Geographical Society took place on 8th December 1862 at which all the experienced China experts were present including Lay, Osborn as well as William Gladstone ➚ (then Chancellor of the Exchequer). British plans and strategy were discussed. Lay and Osborn put forward their view that the flotilla would help transform China for the better by ending the civil war and opening up trade along the Yangzi. Osborn said: ‘he hoped to report that Nanjing has been taken without the loss of one Taiping life’. Gladstone, who had been a severe critic of the Opium Wars, gave his support to them ‘to carry to China the blessings and not the curses of civilization’. An important complicating factor was that the American Civil War (1861-65) had nearly brought the British cotton mills to a halt; Britain hoped China might be as an alternative market for its cloth. Qing dynasty marble boat at the Summer Palace. Built in paddle steamer style with funds earmarked for a new Chinese navy. Eight ships were speedily built: seven gunships and a support vessel - all of them steamers with forty heavy guns between them. Among them were the ‘Pekin’, ‘China’, and ‘Amoy’, as well as a paddle-wheel steamship ‘Kiangsu’ - which was at the time considered the fastest and most modern naval ship in the world. Wags at Shanghai termed it the ‘Vampire fleet’ as it was a Chinese fleet to be used against the Chinese. Just at this time General Charles Gordon ➚ was achieving great success with his ‘Ever Victorious Army’ against the Taipings. He had been appointed by the Chinese in March 1863. He was taking commands from the Chinese generals as a mercenary; however the British chose to consider that he was working for them in the defense of Shanghai. The British run North China Herald ➚ predicted ‘the keys of every stronghold in this province will hang from the girdle of Britannia’. On 30th May 1863, the Taiping forces guarding the town of Kunshan, Jiangsu were astonished to witness the arrival of an armored paddle steamer armed with a 32-pounder cannon on the bow commanded by Gordon; followed by a fleet of 80 junks converted to gunboats. These events took place just as the Lay-Osborn flotilla was sailing to China. From the Chinese perspective Gordon’s activities were far more useful and acceptable than a British controlled fleet. Gordon was content to work under the local provincial commanders and although another ‘difficult’ character, he was seen as more amenable than Horatio Lay. Lay wanted full control of this new naval force, he decided it must sail under its own special flag that he devised, not that of the Qing dynasty who were purchasing it. Lay gave strict signed orders to Captain Osborn: ‘Osborn undertakes to act upon all orders of the Emperor which he may be conveyed directly to Lay; and Osborn engages not to attend to any orders conveyed through any other channel. Lay upon his part engages to refuse to be the medium of any orders of the reasonableness of which he is not satisfied.’ In other words the Chinese had bought a fleet but Lay would command it. Although the British government supported the basic strategy it was not party to the details. Lay set out his reasons for this stipulation ‘This is inserted to meet any objection that might be raised on the ground that Europeans are serving without commissions or direct authority from the Emperor’. 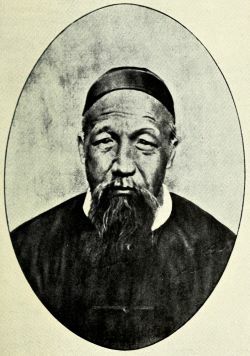 Lay traveled back to China in 1863 ready to take delivery of the ships and resumed his post as Inspector General of the Imperial Customs Union. He showed the flotilla’s terms of the engagement to the Chinese who were absolutely appalled as they had thought that they had bought boats that could be used however they thought fit. 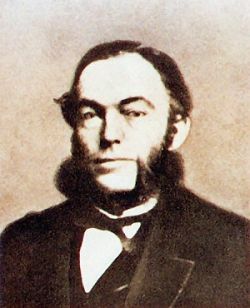 Osborn stuck to the letter of his agreement on his arrival in China, as these terms were totally unreasonable to the Chinese they refused to accept the brand new ships. The action against the Taiping rebellion was commanded by provincial military leaders such as Zeng Guofan and Li Hongzhang not the Emperor Tongzhi himself (then only 7 years old), let alone Horatio Lay – a foreign national. The British had not reckoned on the weakening of centralized control as Qing power dissolved into regions ruled by fractious warlords. General Zeng Guofan had wanted to quickly replace all the British seamen in the flotilla with his own men. Lay overestimated his power and influence in China. General Gordon and his force had already pushed back the Taipings so there was now much less need for the new ships. The Chinese side had had enough and so Lay was sacked in 1864 and packed back to England, he was only to visit China once more briefly in 1869. He became somewhat of a scapegoat for the whole affair as Lord Elgin and the government quickly withdrew their support. The flotilla sailed back to the U.K. and was converted for mercantile use so that the Qing government (and the Americans in the throes of Civil War) could not get their hands on them. Prince Gong and his policy of engagement with the West suffered as a result of the debacle. In 1865 the Empress Dowagers Ci’an and Cixi moved against him and stripped him of his position as Prince Regent. After the defeats to the French over Vietnam he was further reprimanded and demoted in 1884. The Chinese reaction was initially to refuse to buy any ships made abroad but instead build its own navy. Zuo Zongtang activated his plans to build a shipyard in Fuzhou in 1865. Unfortunately the Chinese had no access to the tools and technology for the latest ship designs and the shipyard was run by scholar-officials with no knowledge of Western machinery. In the period 1869-71 only six ships had been built and these were only patrol ships unable to take on foreign men-of-war at sea. They were forced to employ foreign technicians at a high cost and the quality was poor, in 1902 only 14 ships built at the Mawei shipyard were still in service. The Emperor then reversed the policy and created the Beiyang Fleet ➚ (1870-88) from ships built in Britain and Germany. 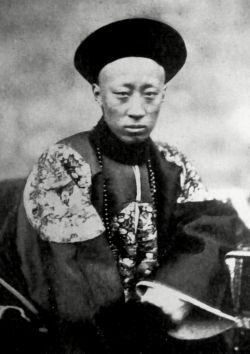 Although it is widely said that in 1888 Dowager Empress Cixi decided to spend the money earmarked for constructing a modern navy on building the new Summer Palace and in particular the famous marble boat, it seems likely that it was Emperor Guangxu who judged that the navy would be ineffective and so a waste of money. His view proved correct; during the Sino-Japanese War of 1894 the Beiyang fleet suffered a humiliating defeat at the Battle of Yalu River, due to a surprise Japanese attack and inferior armament. It was then virtually annihilated in the Battle of Weihaiwei, Shandong in 1895. China then disbanded the navy and was left without any naval defense for sixty years. Citation information for this page : Chinasage, 'Anglo-Chinese fleet of 1862-3 - the Lay-Osborn flotilla', last updated 12 Dec 2017, Web, http://www.chinasage.info/layosborn.htm.